Rapid Rehab has been using low level / cold laser treatment successfully since 2009, and we continue to use laser on a daily basis to help our patients heal. Cold laser works by stimulating healing, decreasing pain, and assisting in the recovery of mobility sooner. Infrared light passes into the body easily with some of the energy from these photons being absorbed by chromatocytes in the mitochondria of the muscle tissue. This energy converts adenosine diphosphate (ADP) into macromolecules called ATP. ATP drives cellular function and metabolism repairing and replicating cells resulting in faster healing times. A common cause of pain is ischemia, restriction in blood supply to muscle tissue, produced by the body’s response to trauma. Ischemia causes inflammation, edema and muscle guarding which contribute to and manifest as musculoskeletal pain syndromes. The application of infrared laser increases cellular function and activity with stimulation, edema is reduced, circulation is increased, and pain is lessened or ablated, with permanent benefit. Result: Patient reports pain was completely ablated with active range of motion restored for two days. He continues to have intermittent but minimal pain with active movement retained. Condition: A woman in her 80s with DJD of the lumbar spine. Result: The laser completely ablated her radicular pain. 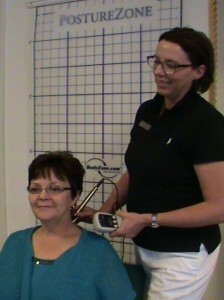 She recovered her posture, gait and functional ability in 10 treatments. She lives independently and has returned to gardening. Treatment: therapeutic exercises, manual therapy, gait training, and laser. Result: Patient was walking without assistive device normally, climbing stairs with minimal use of hands and without pain. Residual pain following therapy was abolished. Surgery was not needed. She continues to live by herself in the family home. Total of 34 treatment visits. Result: Pain completely abolished at rest and during movement. Cervical mobility and strength restored. Patient discharged fully functioning. Result: Walking erect without any assistive device and reporting intermittent low levels of pain. She tolerates a full hour of exercises and is doing some gardening now. She is discharged in 19 visits and has resumed her wellness program. 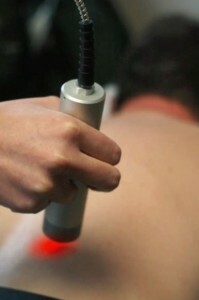 Treatment: Laser was used at the end of most of his sessions following mechanical and manual therapy. Result: Now reports 95% pain free and has fully recovered his lumbar mobility, has full straight leg raises without pain, and can lift and carry 50 pounds maximally. Pain was always minimal or zero after each therapy session. Result: Moderate pain was abolished and heel cord stretch was negative for pain for the first time since her accident. She retained 100% pain removal in one treatment. Our list of successful treatments goes on. Many of these patients might have lived with worsening chronic debility or may have needed surgical intervention. The laser provided necessary pain relief which provided motivation to stick with therapy until maximal benefit was achieved. Further, the laser may have indeed facilitated cell growth and repair sufficient enough to exceed the usual expectations.